A Well-Seasoned Life: A Look Inside "The Picky Palate"
Is it OK to admit that this cookbook was my introduction to Jenny Flake and Picky Palate? 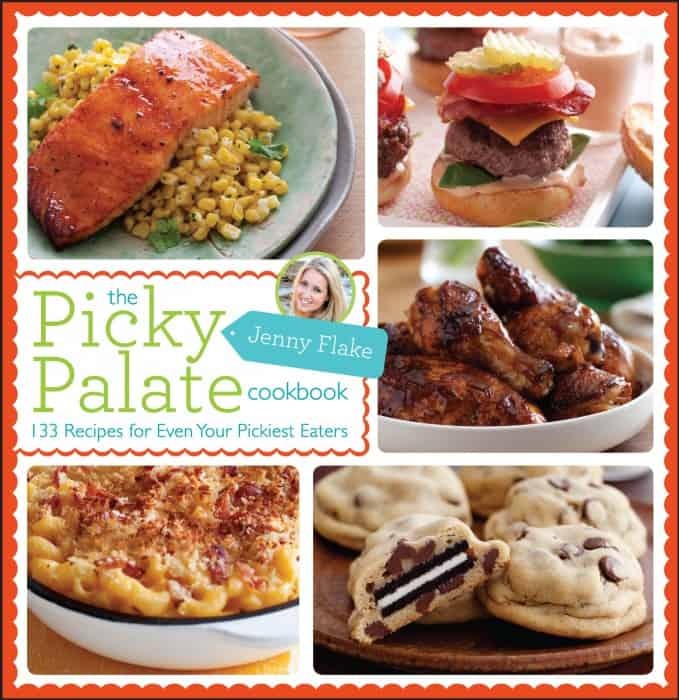 ﻿I think it's OK because that means that you will get my unbiased opinion of this cookbook, The Picky Palate Cookbook. If you're already a fan of Picky Palate, you're going to love this cookbook. 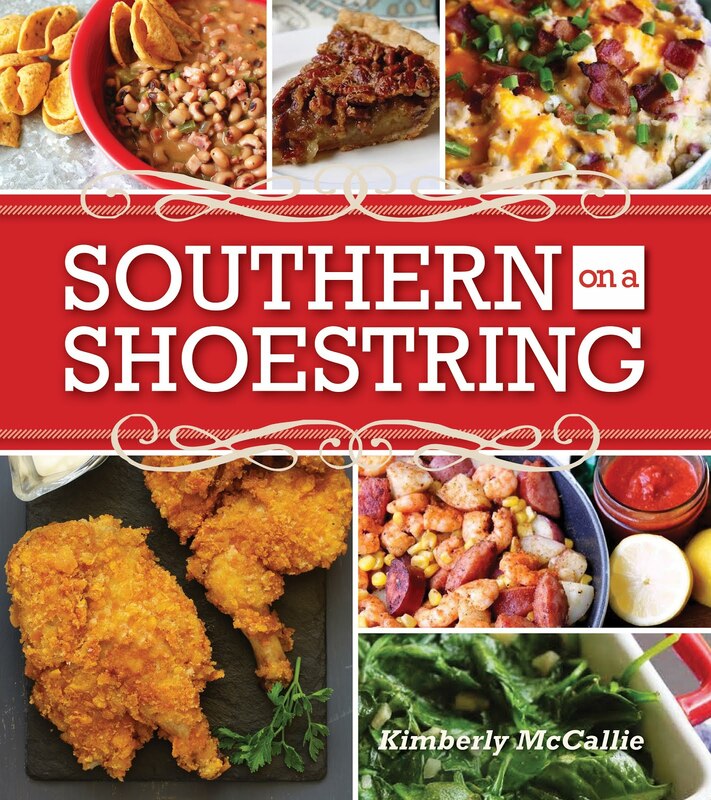 And, if you're new to the world of Picky Palate, you're going to love this cookbook, too. The cookbook cover states that it contains "133 Recipes for Even Your Pickiest Eaters".﻿ But, I like to think the recipes are appropriate for picky cooks, too, because I like to cook recipes that use common ingredients and are simple to prepare. And, that's exactly how I would describe the recipes here in The Picky Palate Cookbook - simple ingredients and easy preparation. "Rise and Shine" features breakfast and brunch recipes. 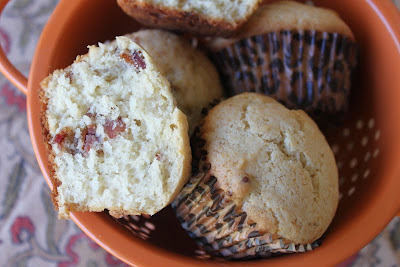 You'll find the recipe featured below for Maple-Bacon Muffins with Sweet Butter along with savory selections such as Bacon and Cheddar Florentine Quiche and California-Style Eggs Benedict. 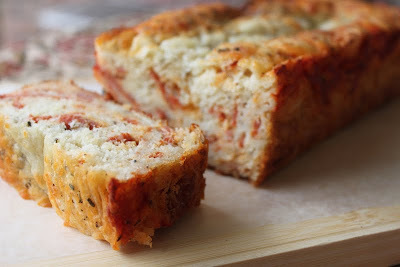 "Get the Party Started" with Creamy Spinach Dip or the recipe I tested, Cheesy Pepperoni Pizza Quick Bread. Yum! "Home is Where the Chicken Dinner Is" is one of my favorite chapters. I have so many recipes marked for testing such as Creamy Chicken-Spaghetti Bake, Peanut-Ginger Chicken Noodles, and Weeknight Shredded Chicken Taquitos. "Gone Fishin'" features the lovely Smoky Maple-Baked Salmon over Garlic Corn that is featured on the cookbook's cover along with Tilapia Tacos with Cilantro-Cream Sauce and Avocado. 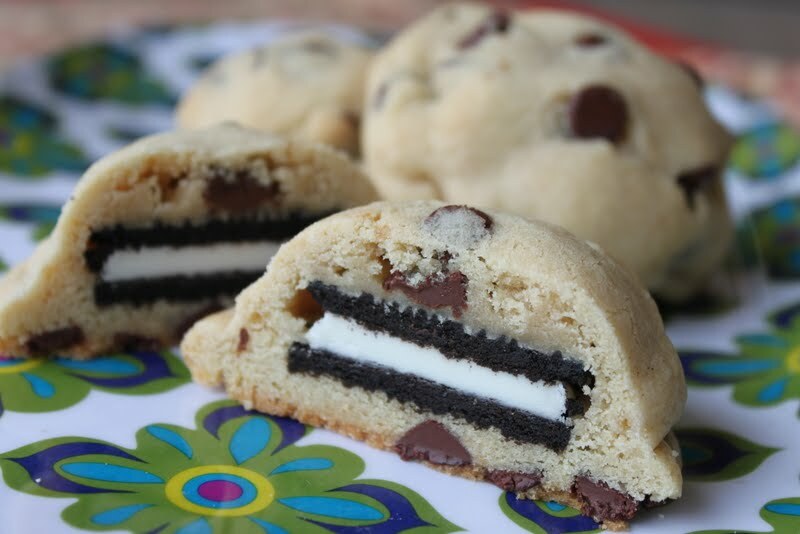 "Bake Sale and Beyond" features the Oreo-Stuffed Chocolate Chip Cookies which have become synonymous with Jenny Flake, but you can find new favorites such as S'mores Stuffed Brownies and Blueberry-White Chocolate Oatmeal Cookies. There have been some wonderful cookbooks released this fall, and I've had the good fortune of getting my hands on some of them. This cookbook ranks right up there with some of the best I've read in the last couple of months. It will be a great addition to your cookbook collection with the beautiful photographs of each recipes, easy-to-use spiral binding, and wide variety of recipes. If you weren't a fan of Jenny Flake's blog before the cookbook, you will be now. I just had to make these since they're infamous. They were so fun to make. Even though it seemed like a simple concept, I was still concerned that I wouldn't be able to pull them off. But, as you can see, I did it! Not only are they cute and provide the "wow" factor that you're looking for, they're also delicious. They reminded me of the cookie store in the mall that sells a thick, sandwich cookie called a Double Doozie. I liked being able to recreate those flavors at home. Plus, I was able to make a whole batch for the price of one of those mall cookies. This quick bread is definitely a crowd-pleaser. It smelled incredible and the fragrance filled the house with the scents of an Italian restaurant. I think you could also make these into muffins, too. Who doesn't love pepperoni? It was delicious! I'm not exaggerating when I tell you that these were AMAZING! Now, I love bacon and the combination of bacon and maple was perfect! I made these for Sunday breakfast. I cooked the bacon while I whipped up the muffin batter. They baked in the oven while I prepared the rest of the breakfast. They were hot and ready to go when we sat down. These muffins were the perfect addition to our breakfast routine. Preheat the oven to 400 degrees. Line a 12-count muffin pan with paper liners. Add the eggs, 2/3 cup of the maple syrup, the vegetable oil, heavy cream, and sour cream to a large bowl and whisk to combine. Add the flour, sugar, baking powder, and salt to the wet ingredients and stir to combine. Add the bacon and stir to combine. Fill the muffin cups 3/4 full with batter. Bake for 15 to 18 minutes, or until a toothpick comes out clean from the center. Add the butter and the remaining 2 tablespoons maple syrup to a small bowl and stir until well combined. Cut the muffins in half and spread with the maple butter. Serve warm. I've never heard of this author. Love the recipes you chose though! Looks delicious! Hi there, there is a new collection of book links going down at Carole's Chatter. This time we are collecting links to posts about your very most favourite cookbooks. Here is the link Your Favourite Cook Books Please do pop by and link in – maybe this nice one? Have a lovely day.